Kitchen Pressing Vegetable Onion Garlic Food Chopper Slicer Cutter Peeler Dicer. 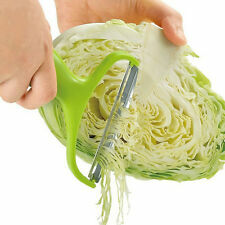 This is a multifunctional vegetable slicer. It features 6 different types of stainless steel blades for variety of slicing & cutting. Strong sharp stainless steel blades makes it easy to cut vegetables and fruits and will last for years. Item type: vegetable peeler. Easy to peel the fruit and vegetable, to slice quickly. Material: ABS stainless steel. Color: green. Size: 11 7.5 4cm/4.33”2.95” 1.57”. Perfect tool for kitchen peeling and slicing. Under the influence of light and the display, the color difference may decrease slightly. Material: Stainless Steel. Color: White. Perfect for cutting green onion, spring onion, shallot and other vegetables ect. Can easily cut the onion and shallot into slices. If you encounter any trouble. Easy to use it, you can cut different shape which you like. Feature: 1. Beautiful outlook and modern design 2.Compact design saves space 3.Easy and Fast 4.Can be cut into two shapes: Helical filaments sheet and roll 5.Easy to clean. Fit for potatoes, carrots, cucumbers, zucchini, radishes and more. Perfect for decorating for a parties, birthday, any special event. Comes with two slicers.Fun for the whole family. New Electric Automatic Peeler Potato Fruit Apple Orange Veg Peeling Machine AU. 1 x Electric Automatic Fruit/ Potato Peeler. Includes a hand thumb knife to scoop out the potato eyes. Ultra safe design: no need to touch or hold the vegetable while it's peeling. Material: Plastic Stainless Steel blade. - Local pick up is available. We are in 2151. - Size: approx. 9.3cm x 5.3cm x 4cm. 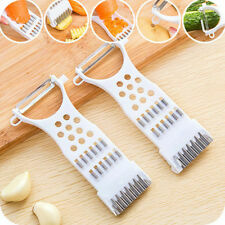 Adjustable Mandoline Slicer Grater. This Adjustable Slicer is an easy-to-use, handy tool that makes zucchini spaghetti, cucumber ribbon strands, curly fries or long, spiral apple strands. This slicer can be easily disassembled and washed under warm water with mild detergent or placed on the upper rack of a dishwasher. EXTRA COMPONENTS: Coming with 2 extra blades, all above tools are storaged intensively in underneath of the peeler. 1 x Electric Automatic Peeler (batteries not included and DC 6V adapter not included ). TRIO PEELERS & JULIENNE, Australian made, 1 yr Warranty. The Polyzand® material is resistant to any deformities or breakage. The Polyzand® is smoother to hold and dishwasher safe. Peels any fruit or vegetable. Get rid of the most original way of peeling with this AUTOMATIC ELECTRIC PEELER. This peeler machine is suitable for potatoes, apples, pears (it can not reach the head and tail part around 2-3 cm) and other vegetable fruits with hard and smooth peel. EXTRA COMPONENTS: Coming with 2 extra blades 1 handy thumb knife, all above tools are storaged intensively in underneath of the peeler. 1 x Electric Automatic Peeler (batteries not included and DC 6V adapter not included). 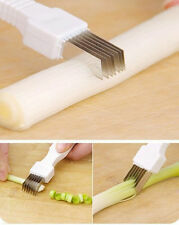 Peeling vegies is much more fun with this stylish cat peeler! This peeler is a real cool cat. D.LINE Groovy Garnishers Set of 2 Garnish Peelers Vegetable Curler & Groover! The groover can also be used on any hard fruit of vegetable to make beautiful grooved edges in your food. The vegetable/fruit curler turns any hard vegetable or fruit into delicate ribbons. Peel, pattern, zest and pit your fresh vegetables and fruit all with these two indispensable tools. Kitchen Smart 18.5cm Citrus Juicer/Spiral Slicer. This compact citrus juicer/spiraliser is perfect for any kitchen. Kitchen Tools. 10 x 10 x 18.5cm size. We are here to help you. Top shelf dishwasher safe. 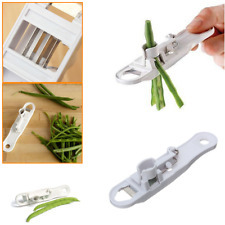 Magic 3pcs Peeler Trio Peeler Slicer Shredder julienne Multifuction Vegetable Fruit Potato Cutter Zesters Kitchen Tool. All our pictures are real product images. The chromatism caused by monitor is not include the quality problem. TRIO PEELERS & JULIENNE, Australian made, 1 yr Warranty. The new Polyzand® handle is smoother to hold, flexible yet very strong and dishwasher safe. The Polyzand® is smoother to hold and dishwasher safe. Vegetable peeler features dual ultra sharp surgical stainless steel swivel double-edge blade. Built-in potato eye remover and orange peeler. If that is what you ask from peelers then this amazing Peelers is made for you! Item type: vegetable peeler. 1 x vegetable peeler (other accessories are not included). Easy to peel the fruit and vegetable, to slice quickly. Material: ABS stainless steel. Color: green, as picture shows. 1 x Vegetable Peeler. Good kitchen helper, vegetable and fruit can be cut to slice and shred. 1 x Curl Silcer. It has been an practical tools in kitchen, ideal for most of vafetables and fruit. An useful kitchen tool that can make peeling easier and quicker. Under the influence of light and the display, the color difference may decrease slightly. Color: White. Made of stainless steel material, durable for use. 2x Kitchen Smart 18.5cm Citrus Juicer/Spiral Slicer. This compact citrus juicer/spiraliser is perfect for any kitchen. Kitchen Tools. We are here to help you. Top shelf dishwasher safe. Plastic/AS/PP/Stainless Steel. CatPeeler Cat Vegetable Peeler CATPEELER CAT VEGETABLE PEELERThe purrfect kitchen gift for cat-loving chefs is this CatPeeler Cat Vegetable Peeler by Peleg Design. This cat-inspired vegetable peeler is not only adorably cute, but he'll help you prep all your fruit and veggies to boot! WALFOS Mandoline Peeler Grater Vegetables Cutter tools with 5 Blades Included. You will receive 1 grater 5 blades. Design: 5 pieces Blade. Type Fruit & Vegetable Tools. Fruit & Vegetable Tools. No Fuss No Hassle. 1 x Electric Automatic Fruit/ Potato Peeler. Includes a hand thumb knife to scoop out the potato eyes. Ultra safe design: no need to touch or hold the vegetable while it's peeling. More hygienic than manual peeling. Preparing apples is a breeze with the Kitchen Basics peeler, slicer and corer. Using an easy. 1 X Peeler. perfectly sized and proportion, making them great for apple pies and pastries, or before/after dinner snack. Pack of 3 x PLASTIC POTATO PEELER - Veggie fruit/vegetable/carrot skinner CHEAP! Plastic Potato / Vegetable PEELERs. Handle Material: Plastic. IN AUSTRALIA. 1-Standard peeler (Blueor Black). 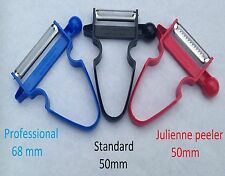 2-Professional Peeler (Black or Blue ). 3-Julienne Peeler(Red ). 1- Use the standard peeler. If that is what you ask from peelers then this amazing Peelers is made for you! Vegetable peeler features dual ultra sharp surgical stainless steel swivel double-edge blade. Built-in potato eye remover and orange peeler. Potato/ Vegetable Peeler. Pick Up Available from Highett, Vic 3190. In the kitchen we often find the smaller the tool, the bigger the punch. Prep sprouts in a snap with the compact Twist’n Sprout - simply press Brussels sprouts onto the tip of the tool and twist to remove core for a more evenly cooked vegetable. 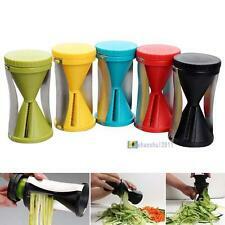 The perfect to create vegetable stirfries or pasta dishes. 1 x Spiral Slice. Special, sturdy Japanese blades made of stainless steel. 1- Use the standard peeler. 1-Standard peeler, 2-Professional Peeler, 3-Julienne Peeler. New Electric Automatic Peeler Potato Fruit Apple Orange Veg Peeling Machine AU. 1 x Electric Automatic Fruit/ Potato Peeler. Ultra safe design: no need to touch or hold the vegetable while it's peeling. Features: SAVE TIME: Slice Bananas In One Easy Simple Step PERFECT SHAPED: Add Perfectly Shaped Slices To Your Morning Breakfast Cereal Bowl KIDS SAFE - No More Banana Slicing With Sharp Knifes or Tools. Specifications: Material: Plastic Size: 25*7cm Color: Yellow Package Included: 1 * Banana Slicer Notes:.